We have many new features and improvements to the hopTo Control Panel in version 2.2! 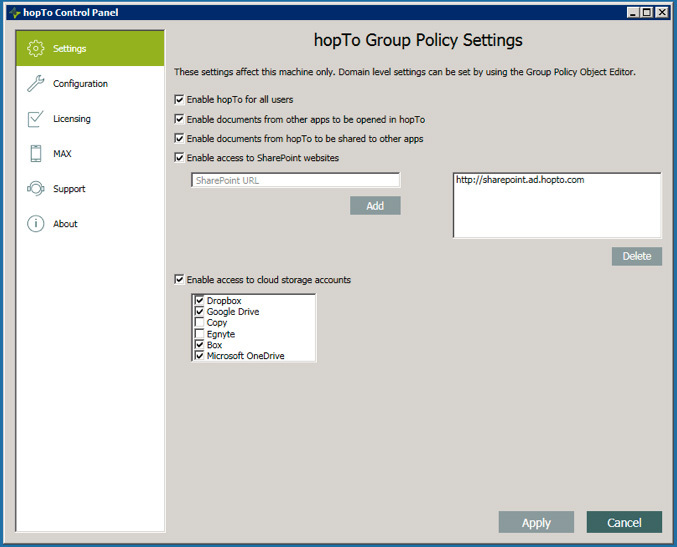 You can edit the Group Policy Settings at any time for all users. Note that the new settings will not take effect for currently logged in users until they log off and log back in. 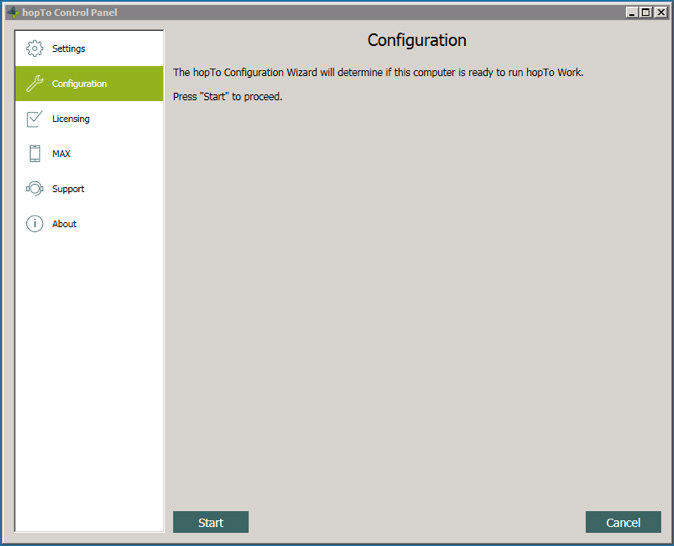 The Configuration Wizard screens verify that your system is compatible and ready for hopTo Work. If a category is not compatible, a red X appears with a help link. Click Start to begin the Wizard. In this sample screen, you can see that three of the four items have been completed while the Office version and activation are still in progress. This sample screen shows a successful configuration process and all the items are checked. This system is compatible and ready for hopTo Work. If a red X does appear, click Refresh and let the Wizard run again. If the red X appears a second time, click the link to receive help with the issue. After the trial license has expired, a permanent license must be activated on the computer and individual users must be authorized. You can also configure a license server on a different computer. Under the 'Activated licenses’ list, click Add. Permanent licenses can only be used by authorized users. In the Control Panel on the host, click Licensing. Under the 'Licensed users’ list, click Add. In the Control Panel, click Licensing. Select the license in the ‘Activated licenses’ list. You can activate a specific or partial number of seats. Enter the number of seats that you want to activate. If more than one hopTo server needs to be configured, follow these steps. Stop the hopTo License service on Host 2 to ensure that Host 2 is not using its local license server. Under License server drop-down list, select Other computer. Enter the address of Host 1 in the Address field. 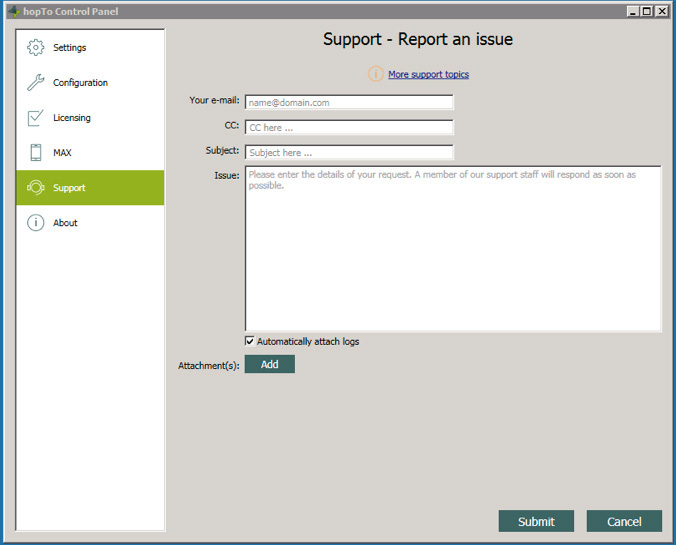 The Support panel lets you report an issue and gives you immediate access to the hopTo Work Helpdesk. Fill out the form and click Submit to report an issue. 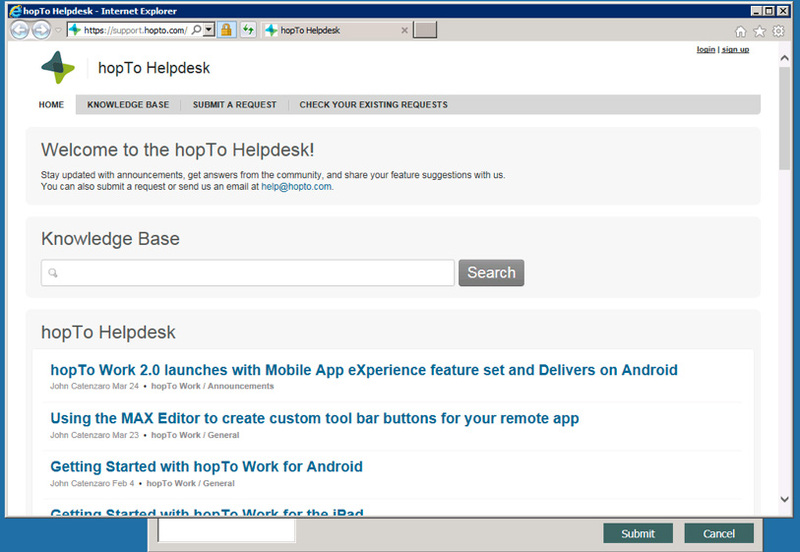 When you click the More Help Topics link, the hopTo Work Helpdesk appears in a browser window.